Casco Bay High School, an expeditionary learning school in Portland, ME, requires all juniors to complete an internship in a field the student is interested in. I have always loved exploring and the world around me, so I immediately thought to reach out to Hurricane Island Center for Science and Leadership when looking for a place to intern. Ever since participating in their week-long Marine Biology program in the summer of 2015, I have been exploring my passion for science and how it can be turned into a career. 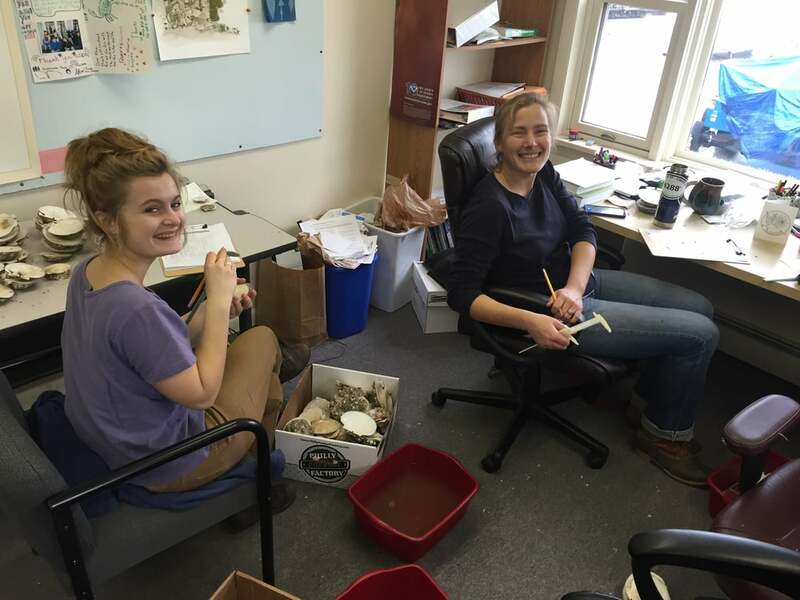 To start the internship process, I reached out to Phoebe Jekielek, the Outreach and Marketing Coordinator for HICSL, and she went to work scheduling a time that I could come up to Rockland to help measure shells for what she called a “shell blitz”. On October 18th and 19th, we worked with Caitlin Cleaver, the island’s Director of Science and Research, measuring shells for the Midcoast Maine Collaborative Scallop Project. We used calipers to record the distance between rings, which on scallops, helps to determine growth rates. Cait and her intern, Bailey, traveled to Woods Hole last year to learn this method from scientists studying the same process on other scallop populations. Although this process sounds quite objective and simple, it was surprisingly difficult to determine whether rings were laid down annually or seasonally. Working to evaluate places where human error might interfere with data collection, I was given a good idea of what it is like to work in a field where research is crucial and is conducted frequently. Scallops are bivalve mollusks, meaning they have a small body enclosed within a hinged shell. When we eat scallops, we are eating the adductor muscle; a strong, proportionally large muscle that is strong enough to propel the scallop through the water. One of the main goals of the collaborative scallop project is to assess the effectiveness of a small-scale closed area in rebuilding resident scallop populations. You may wonder why so much time and effort was expended on collecting data for these little creatures; we did, after all, have about 1,800 shells to get through. The scallop industry is a crucial part of Maine’s economy, supporting many families dependent on the bivalve mollusk through its fishing, processing, and distribution. Fortunately, the industry is doing well in Maine, due to many regulations that have ensured the safety of scallop production. Some of these regulations include setting up closed areas where no scallops can be fished until the population rebounds. We worked with scallop shells taken from the lower Muscle Ridge area off of Spruce Head Co-op, an area chosen by local fishermen to be a three year closure in the name of research. Scallops that are not in closed areas are harvested only between December and mid-April. Scallops, Clams and Mussels... Oh My! Older PostAquaculture comes to Hurricane! !